My name is Gonçalo Tomás and I’m a software developer at Kobil Systems. My areas of interest include distributed systems, security, data replication, weak consistency models, fault tolerance and dependability. This is my first Erlang gig and I’m very excited! I am working remotely for Kobil, doing some development and architecture work. I’ll update this section with more details eventually. Working for the community version of Riak, I am reworking a key component in running all sorts of tests for the Riak database. Basho1 reinvented the wheel by building a custom test runner facility along with other tools to measure code coverage that were already were available as standard tools in Erlang. My task is to take the Riak test suites that are tightly coupled with the custom test runner and make them work with the standard Erlang tools for running intricate tests (Common Test). Worked as a software developer for a startup in the advertisement business, working on its website using React as well as some basic database components. Participated in the architecture of some backend services. Implemented a Protocol Buffer communication layer for the Lasp project and worked on maintaining a benchmarking tool to make it compatible with modern Erlang versions. Performed multiple integrations with payment gateways for a niche online clothes shop. Also helping out as a system administrator for periodic software updates and more technical website configurations. 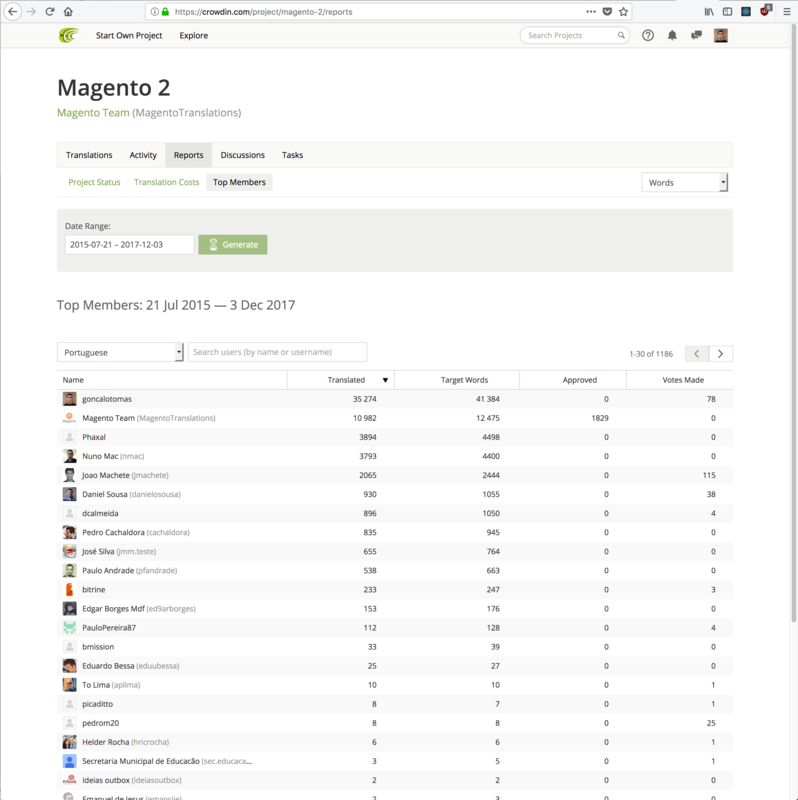 Translated more than 35.000 strings from the Magento 2 software into Portuguese, eventually becoming the top 1 contributor, surpassing auto translations from the Magento team. Electives: Database Systems, Distributed Systems and Algorithms, Dependability/Reliability of Distributed Systems, Network Security, Software Security, Construction and Verification of Software. This is my master’s thesis: a new proposed standard for a database benchmark specifically targeting NoSQL data stores. Despite some existing synthetic benchmarks for these types of storage systems being extremely popular (YCSB), our benchmark is based on an real application, FMK, which is responsible for managing nation wide medical prescriptions for patients in Denmark.